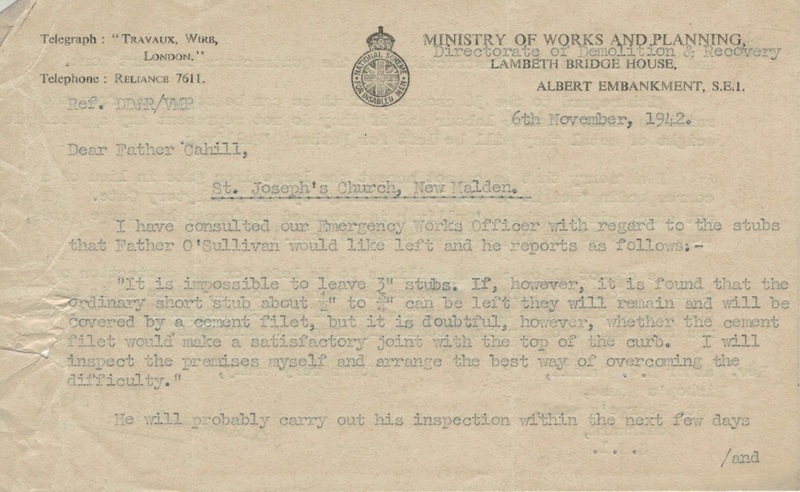 In July 1940, Lord Beaverbrook, the Minister of Supply, launched a press campaign for the public to donate aluminium pots and pans to make fighter aircraft: "We will turn your pots and pans into Spitfires and Hurricanes, Blenheims and Wellingtons." 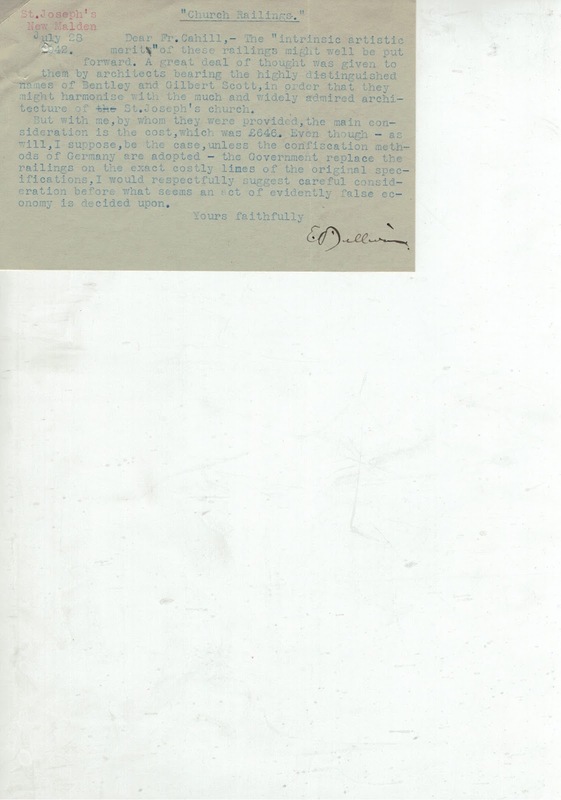 The public responded by donating over 70,000 tons of aluminium, a good percentage of which was recycled in aircraft production. Beaverbrook also identified a need for heavier raw materials like iron and steel for munitions. 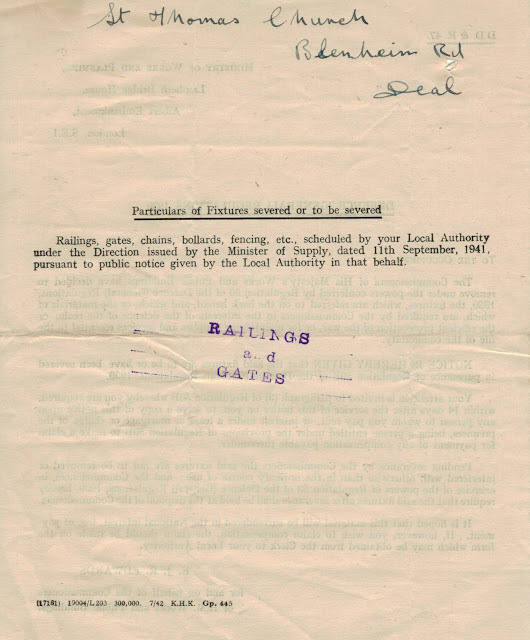 In 1941 the government passed an order compulsorily requisitioning all post-1850 iron gates and railings for the war effort, with a few exceptions made for items of particular historic interest, usually elaborate gates. 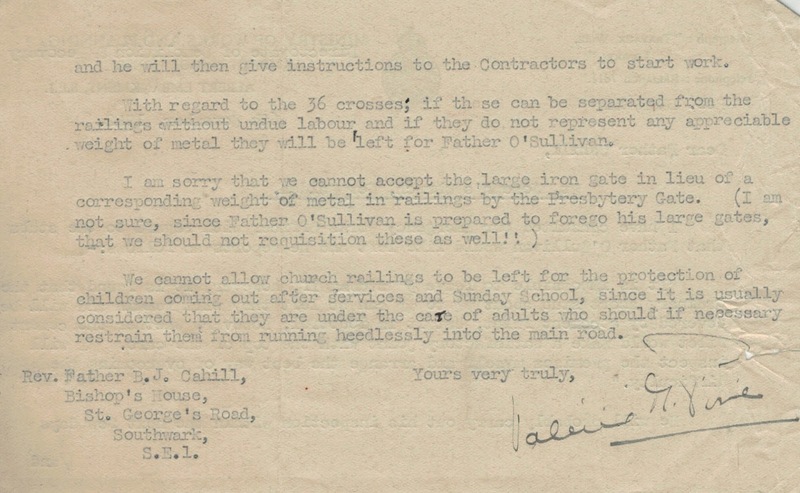 The fate of much of the cut down ironwork remains a mystery and there is considerable scepticism over how much iron was recycled for munitions and how was much merely dumped. 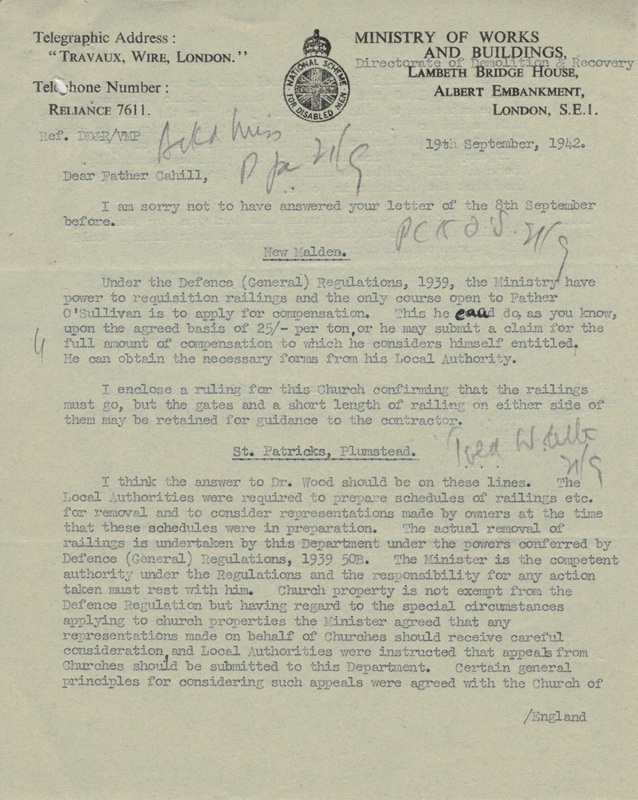 The archive holds a large file of correspondence relating to the requisition of iron railings and gates from the Diocese’s churches during the war. There is also a file of correspondence outlining compensation claims made for these railings and gates after the war. 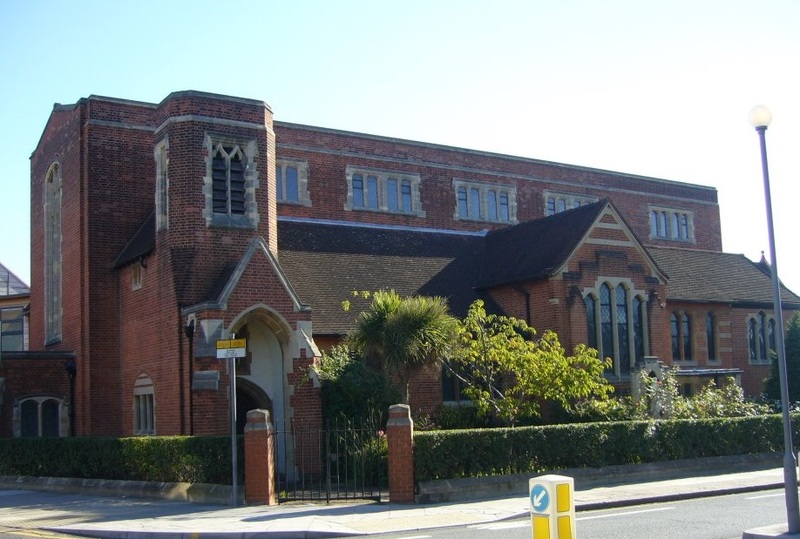 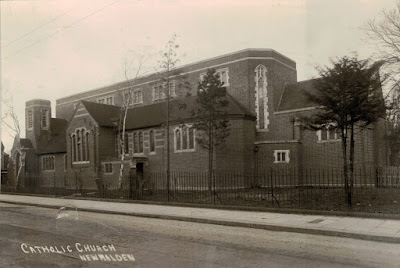 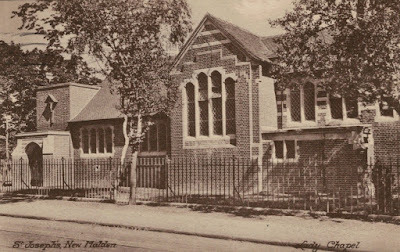 While most priests allowed their railings to be taken, Fr O’Sullivan, parish priest of St Joseph’s church in New Malden, was very reluctant to do so. 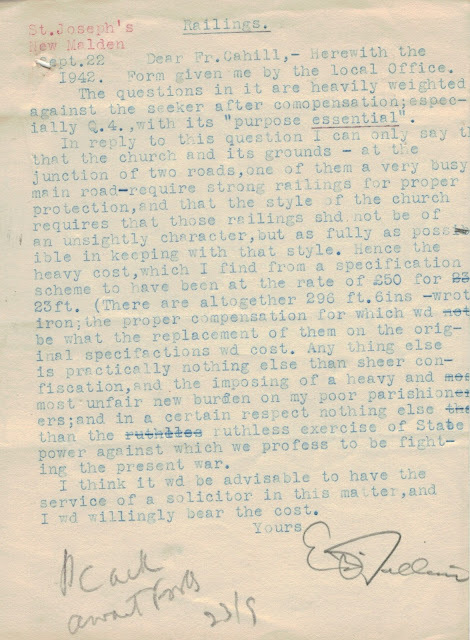 He petitioned the Bishop and the Ministry of Works and Planning to save his railings and, if this could not be done, to ensure he got adequate compensation. 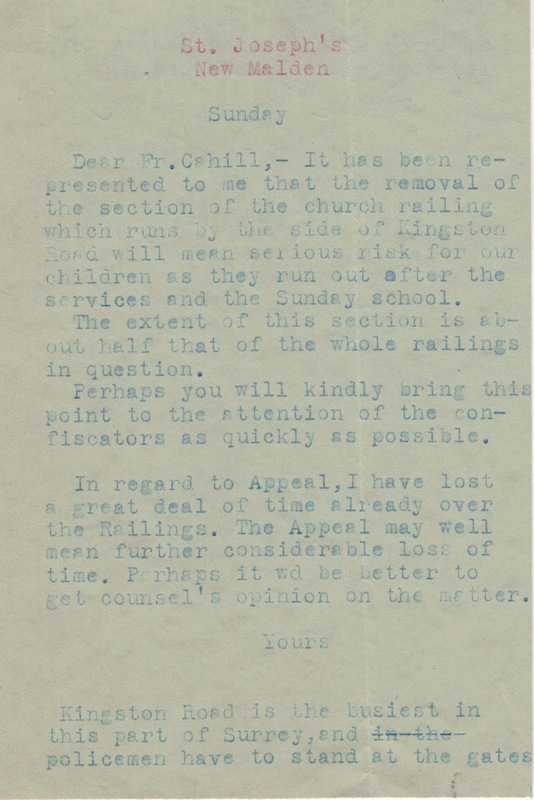 Fr O'Sullivan put forward two of his concerns about the removal of the railings. The first is their artistic merit and the second is that he paid for them and it seems like a false economy to remove them. We can follow the saga of St Joseph’s railings through the correspondence in the archive. Below you will find a selection of this correspondence which was largely between Bishop’s House, Fr O’Sullivan, the Ministry of Works and Planning and the Diocesan solicitor, Mr Fooks. 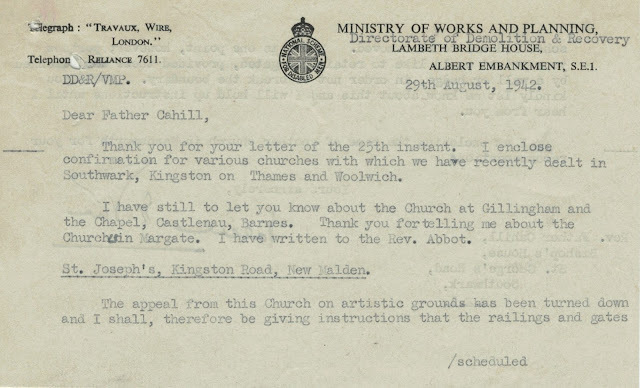 Letter from the Ministry of Works and Planning saying that St Joseph's appeal on artistic grounds has been turned down, 29 August 1942. However, Fr O'Sullivan may like to retain his gates, 29 August 1942. Letter from the Ministry of Works and Planning saying that the only option left to Fr O'Sullivan is to claim compensation. He can however, keep the gates and a short length of railing on either side of them, 19 September 1942. 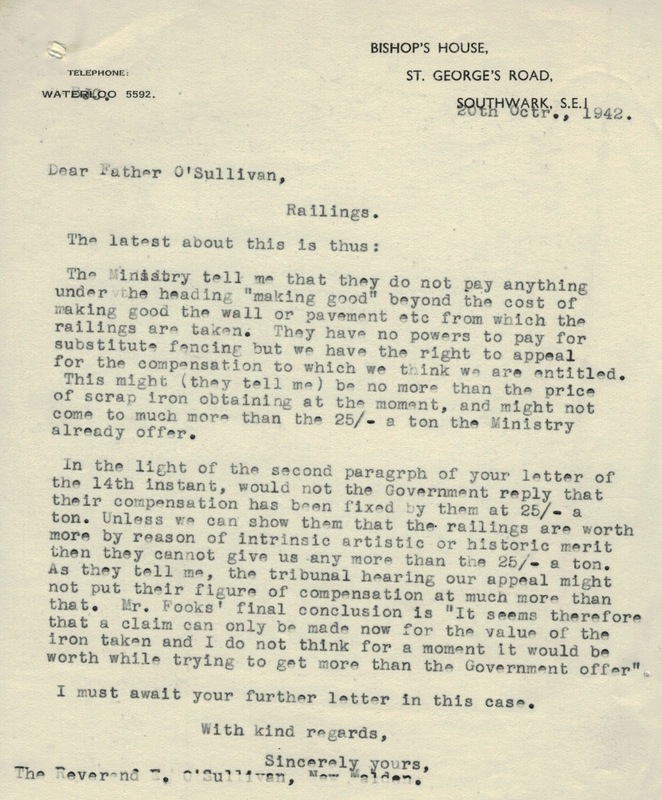 Letter from Fr O'Sullivan complaining about the compensation form that he has been asked to complete, 22 September 1942. 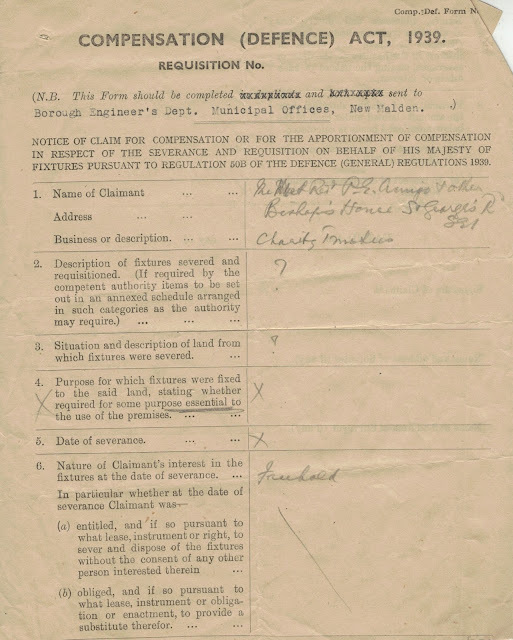 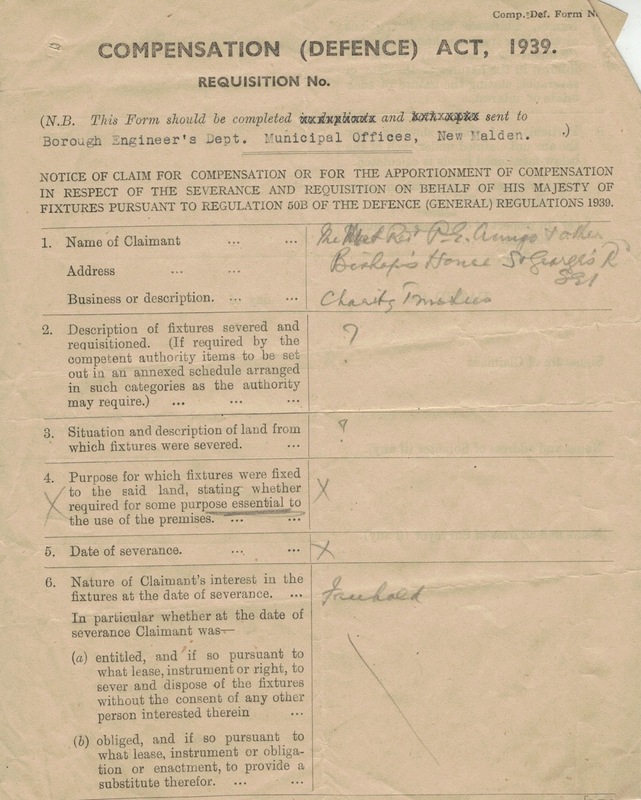 The compensation form that Fr O'Sullivan has been asked to complete, 22 September 1942. 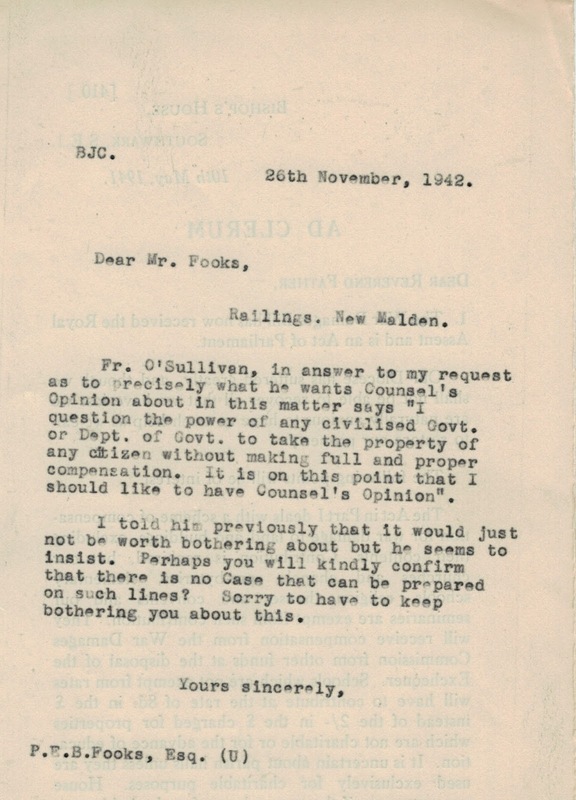 Letter to Mr Fooks, the Diocesan solicitor, about Fr O'Sullivan's compensation claim, 8 October 1942. 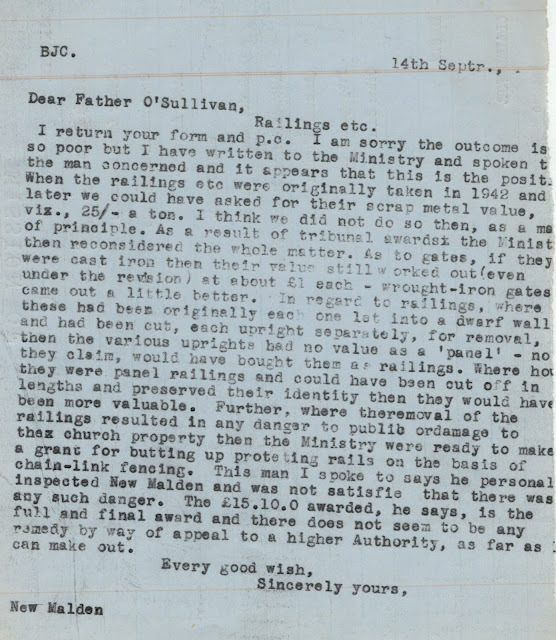 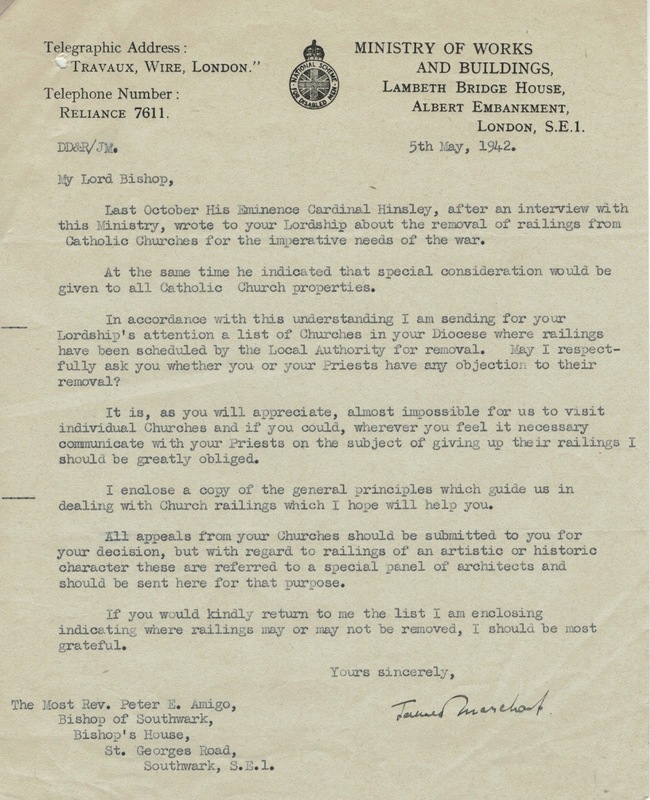 Letter from Bishop's House updating Fr O'Sullivan on the situation regarding St Joseph's railings and possible compensation, 20 October 1942. Letter from Fr O'Sullivan giving another reason for the importance of St Joseph's railings, 2 November 1942. 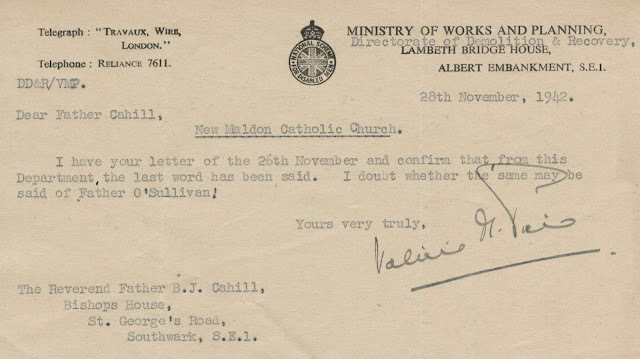 Letter from the Ministry of Works and Planning responding to some of Fr O'Sullivan's requests and suggestions, 6 November 1942. Letter to the Diocesan solicitor, Mr Fooks, about Fr O'Sullivan's desire to "question the power of any civilised Government or Department of Government to take the property of any citizen without making full and proper compensation," 26 November 1942. The Ministry of Works and Planning give their final word on St Joseph's railings, 28 November 1942. 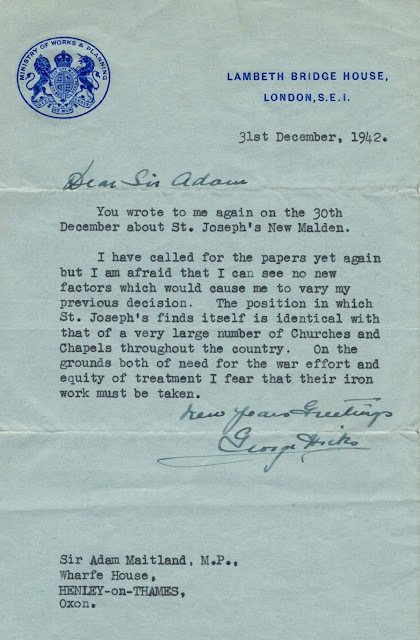 There are several letters to and from Sir Adam Maitland MP in relation to St Joseph's railings. 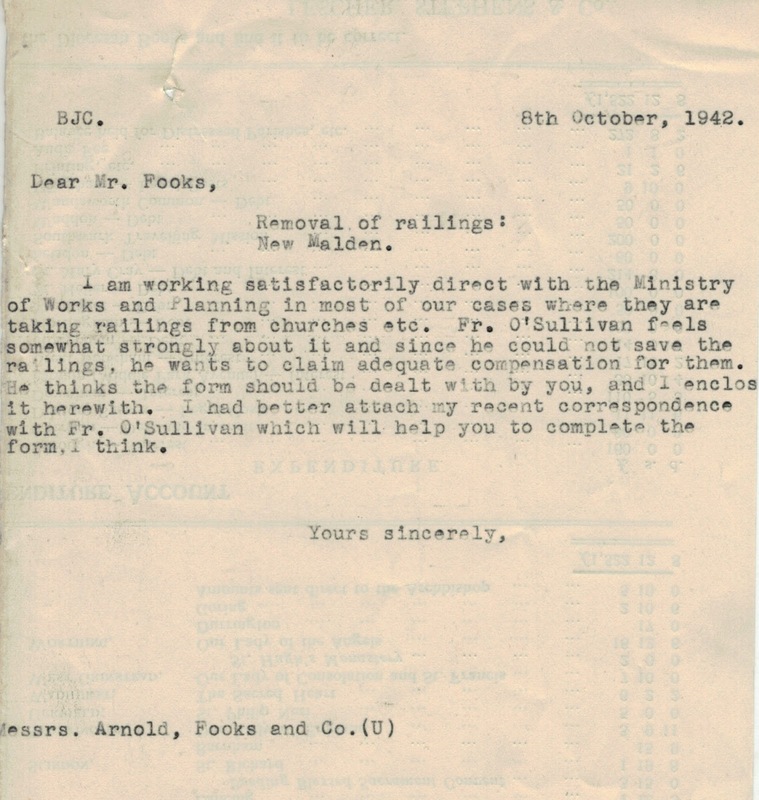 Fr O'Sullivan must have asked Sir Adam to help him with his case. 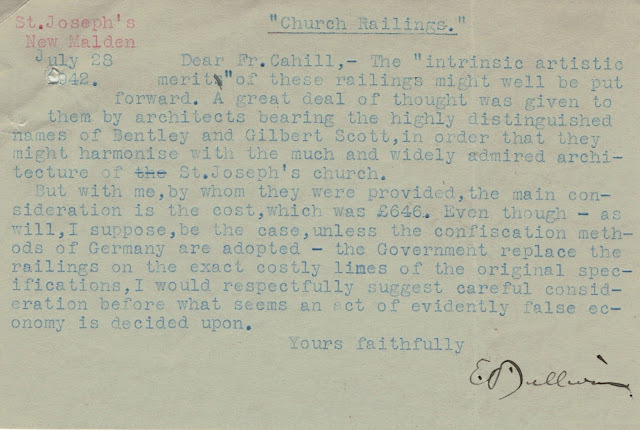 As we can see in the photograph of St Joseph's above, Fr O’Sullivan lost his church's iron railings though he did keep the gates. 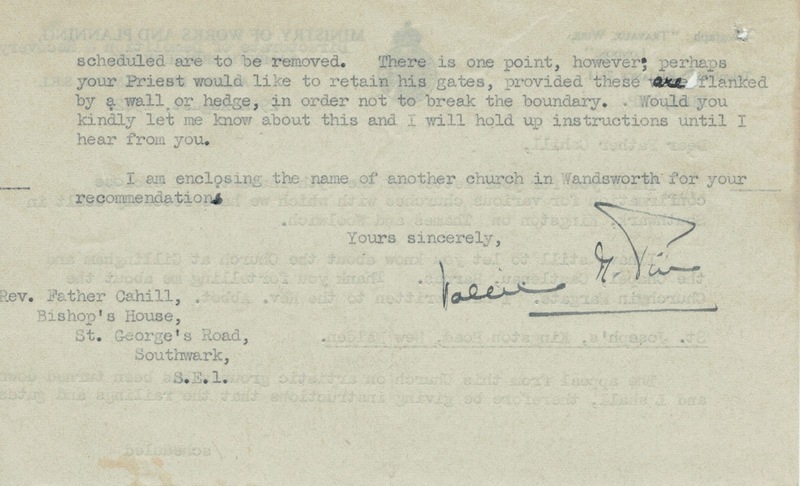 Today the stumps of the original railings can still be seen on the low wall that runs under the hedge which surrounds the church. 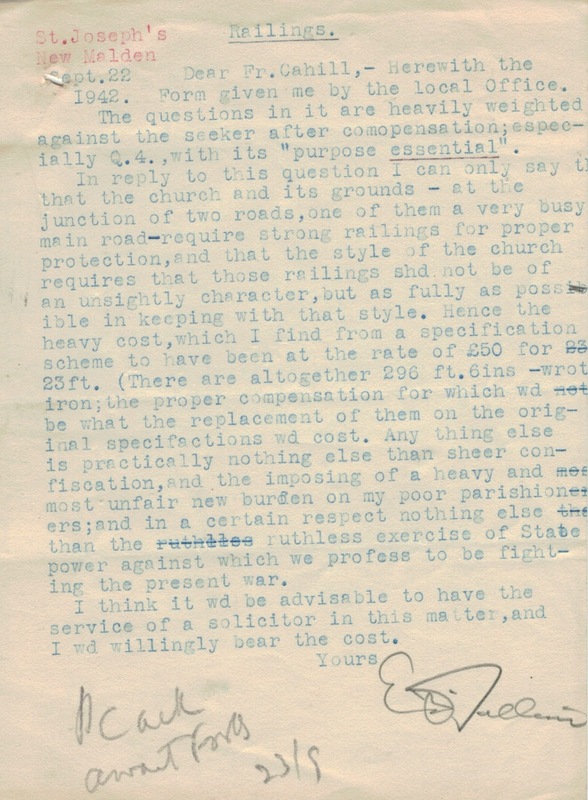 In 1947, the Ministry of Works sent this letter to churches offering them the opportunity to apply for compensation if they could prove the railings were necessary for the protection of the fabric of the church or for public worship. 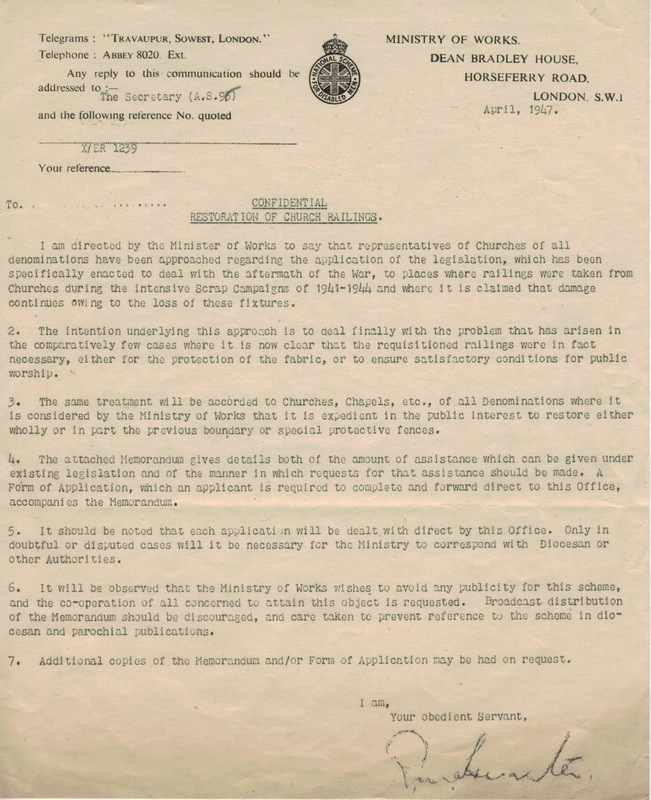 However, the story does not end in 1942. In 1948 we find that St Joseph's is finally awarded compensation (it appears they did not, after all, claim it in 1942). 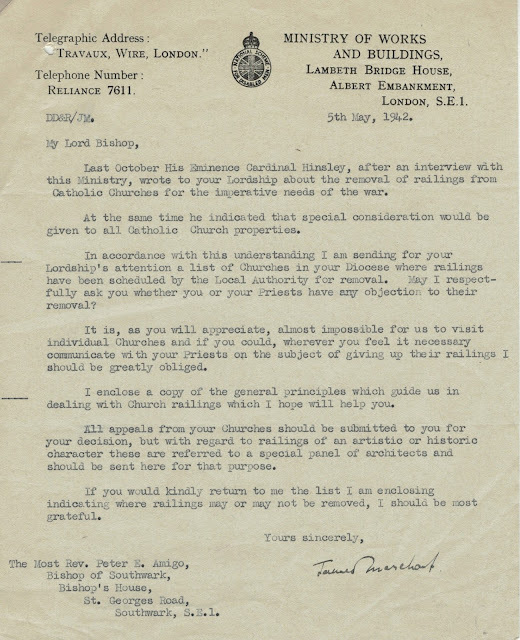 Compensation awarded to St Joseph's, 28 September 1948. Letter to Fr O'Sullivan about the compensation awarded, 14 September 1948. 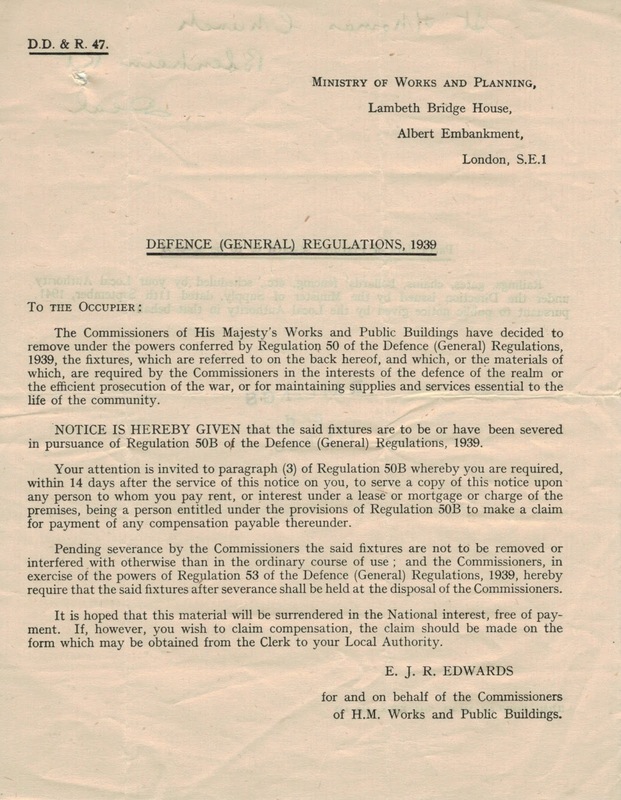 The Ministry of Works and Buildings existed from 1940-1942. 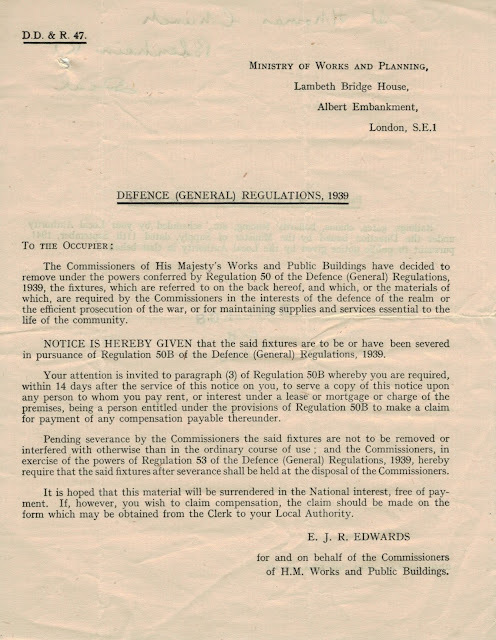 This became the Ministry of Works and Planning from 1942-1943 and the Ministry of Works form 1943-1962. Wikipedia, https://en.wikipedia.org/wiki/Ministry_of_Works_%28United_Kingdom%29.